Adam LaVorgna and Craig Shimahara on the set of Masterless. For a few years, I have helped with the promotion and distribution of a Christian samurai short film called Good Soil. Now, writer and director Craig Shimahara is creating a new, feature-length movie called Masterless. While Good Soil was a historical fiction, based on real events, and real people during the early Christian missions to the Japanese, Masterless is a modern parable. Kane Madison is a Los Angeles architect, played by Adam LaVorgna (7th Heaven), struggles with real world problems while his doppleganger spirit mirrors the struggle in a feudal Japanese-inspired spirit world. The film is also to be the U.S. debut of Kaho Minami, an accomplished and award-winning actress who has performed in over 60 films from Japan. 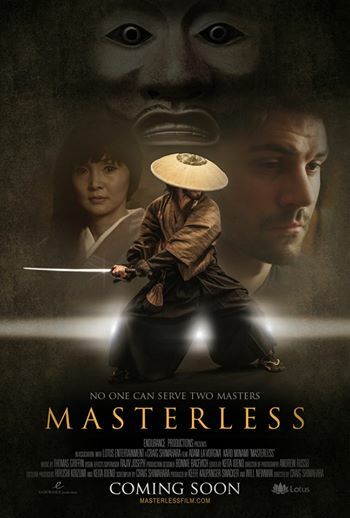 Masterless is a tale of spiritual combat, with the taglines “No One Can Serve Two Masters,” and “An Ancient Battle Rages Within Each of Us.” As we can tell from the trailer, Kane declares himself to be his own master. A samurai who was without a master was called ronin, or “wave man,” since they tended to drift aimlessly. If you would like to find out more about the movie, Craig has been posting behind the scenes information and updates on the Facebook page. The official website is MasterlessFilm.com, and the IMDB page can be found here. At this time, the movie is in post-production and no release date has been set. Follow the Facebook page for the latest information, and I will keep you posted of what I hear on this blog as well.